The Debevoise partner, named last week to help lead CBS' probe into harassment allegations against Leslie Moonves, is also investigating failure-to-report claims against Ohio State football coach Urban Meyer. 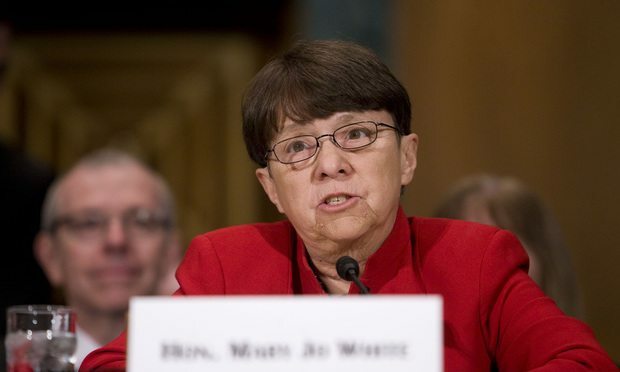 Mary Jo White, speaking before the U.S. Senate Committee on Banking, Housing, and Urban Affairs during her confirmation hearing to be chair of the U.S. Securities and Exchange Commission on March 12, 2013. Photo by Diego M. Radzinschi/ALM. Debevoise & Plimpton partner Mary Jo White is in demand.